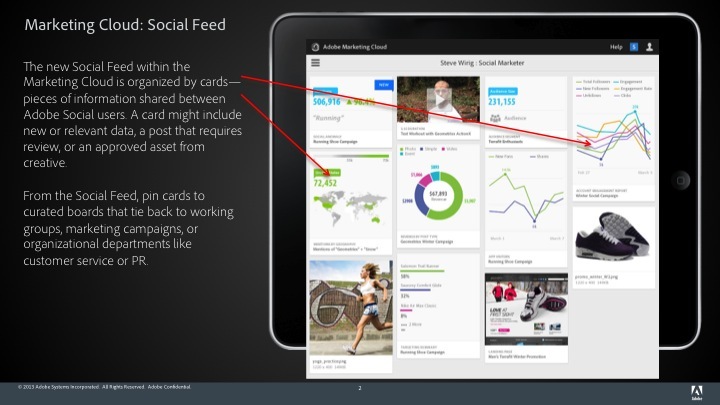 Adobe today launched its updated social marketing platform. With this release, Adobe Social is now featuring social predictive publishing capabilities, a new mobile interface, streamlined reporting, better collaboration, plus integrations with Flickr, Foursquare, Instagram, and LinkedIn. As part of Adobe’s Marketing Cloud, this social solution was set up to enable marketers to not only listen to conversations taking place about their brand, but also to engage and execute campaigns against. The goal is to better pair a company’s social media efforts against their business results. Governance (monitoring roles and permissions to help scale social efforts). 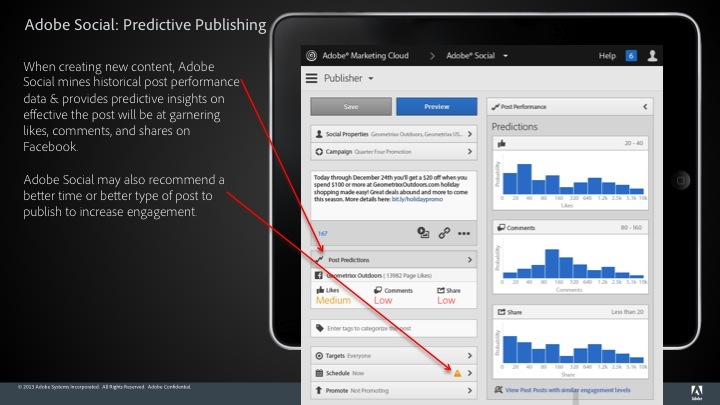 With today’s update, brands and marketers that leverage Adobe Social will also receive predictive publishing. What this means is that the platform will be able to predict the amount of engagement a Tweet, Facebook post, or any piece of social content will receive before it’s published. This new feature examines the crafted content and measures it against previous posts and will offer up suggestions on not only how to improve it, but the best times to share it with your community. With the Marketing Cloud, one of the things Adobe realized was the complexities that occurred when users were trying to log in. Today, the company has rolled out a single sign-on feature, which works not only across the entire company, but also with external teams. The goal with single sign-on is to enable users to log in to any of the Marketing Cloud’s products from a standard interface. Once signed in, Adobe users are going to see a social feed that showcases internal content and hopefully actionable information that employees can use across all of the Marketing Cloud solutions. Adobe Social has also added four new social networks supported by its platform. These include Foursquare, Instagram, Flickr, and LinkedIn. Now, content from these networks can be pulled into Adobe Social enabling users to listen to what their community is saying, where they’ve been checking in, photos that have been uploaded, and more. With Foursquare, Adobe has tapped into the location-based social network’s firehose, thanks to its relationship with Gnip. Marketers can examine the patterns in check-ins, look at the competition, and see how their marketing campaigns can take advantage of where a particular customer is. In addition, marketers can now post content directly to their LinkedIn company pages and groups in the hope of bolstering its professional community. Adobe believes by doing so, brands can be better in tune with not only consumers, but also addressing the enterprise. All of these updates are available starting today, with the exception of LinkedIn. Adobe says that the social network’s integration is on a limited beta release with general availability expected later this year. No pricing changes have been made as a result of these new features.